Spartan Games is hugely excited to announce the much-anticipated launch of Planetfall – a fast-paced, action packed game of massed 10mm armoured and infantry conflict set in the Firestorm Armada galaxy. Devastating tanks, sleek aerial units, crushing artillery, orbital drop-ships and elite infantry forces fight over objectives, each side seeking to achieve their key objectives at the expense of the other. Planetfall uses an ugo-igo system, with an activation mechanism based around Helixes – the building blocks of every force. Games are tactical, combat is ferocious, and the gameplay engine is built around Spartan Games’ established Exploding D6 mechanic, making it fast and intuitive. (1) Battle For Proteus Prime: is a 2-player battle box that contains over 34 stunningly detailed gaming models, full colour rulebook, campaign book, scenery, and so much more. 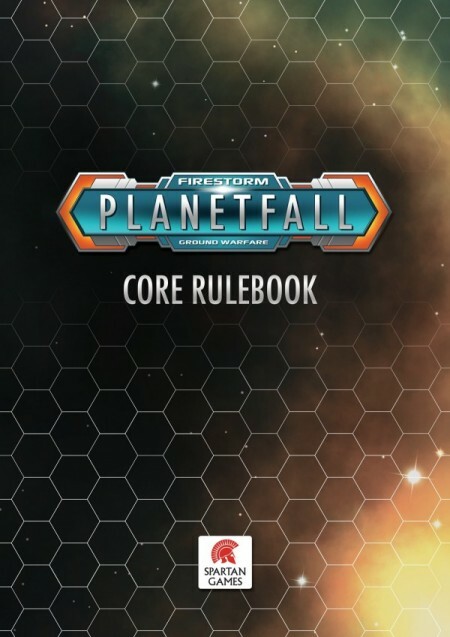 The plot for this Boxed Set sparks off a major offensive in the Storm Zone, and in time will itself fuel an exciting Firestorm Armada 2-player boxed set. On the surface of Proteus Prime, Aquan Prime and Directorate forces have turned this desolate planet into a raging warzone. There is a deadly secret on this world, and the Directorate want it all costs, and the Aquans want it kept buried. Drawn into the conflict are two Alliance Races, the Terquai and Works Raptor. The ideal way to plunge yourself into Planetfall ground warfare in the Firestorm Galaxy! 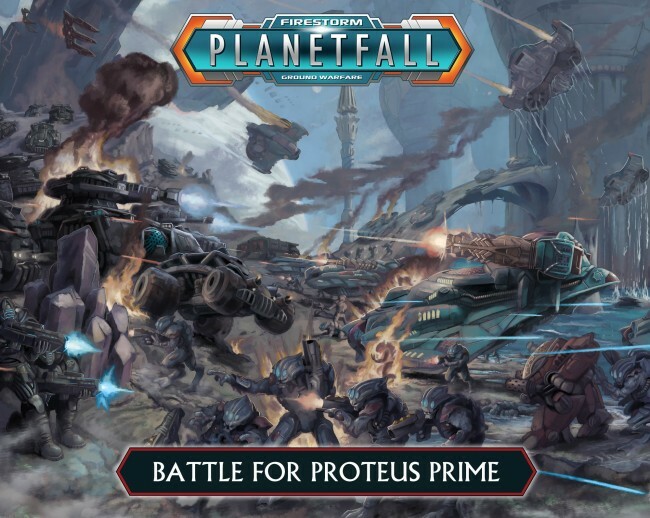 Click here (Link no longer working) to get your hands on Planetfall’s Battle For Proteus Prime! 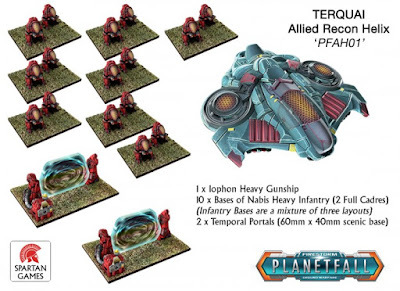 (2) and (3) TWO Allied Expansion Helixes: These expansion Helixes (up to TWO per core force can be added) instantly allow players to expand the Directorate and Aquan forces found in the Proteus Prime Battle Box. The Terquai are close allies of the Aquan Prime, and this Recon Helix is intended to aid Aquan forces in harassing their opponents. The Iopphon Heavy Gunship lays down devastating fire, while itself soaking up enemy attacks, and can be used to deploy Temporal Portals onto a battlefield. The flexibility of this Helix though comes from the two cadres of Nabis Heavy Infantry Drones which can use the Temporal Portals to be transported instantaneously into battle zones. Works Raptor ground forces are, like their space fleets, all about stabbing the enemy in the heart. The GX-74 ‘Witch‘ Heavy Interceptors are sleek, fast and deadly, and a match for any aerial foe. The LR-6 Recon Tanks are all about capturing strategic objectives, and then having the fighting prowess to hold on to it. Also included in the Helix is a crashed Works Raptor Escape Pod which can be used as part of a narrative driven scenario, or simply as a Strategic Objective. (5) Pre-printed Terrain Box: made from acrylic and pre-printed laminated card for the ideal balance of quality and weight, these can drop straight into a battlefield. 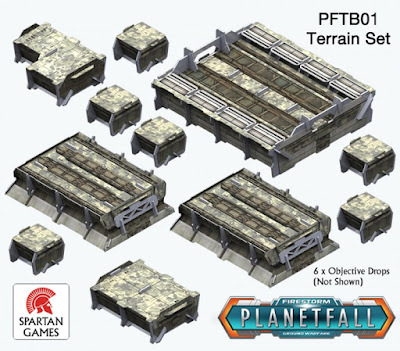 You get 11 terrain pieces – the largest is 193mm long! Click here (Link no longer working) to grab your pre-printed terrain! Gift 1: A superb multi-part, highly detailed resin model of a Terquai Crashed Shuttle. See the attached picture to see how cool this model is! Note: The Terquai Shuttle will fit together, and inside the Battle for Proteus Prime Boxed Set is a pre-printed A5 image gamers can use as a battlefield objective. The resin model is designed to sit on top of this, or can be spread about a battlefield. Gift 2: We loved the cover art so much we commissioned the artist to create two more Battle Scenes from Proteus Prime: The same scene, but from the two Commanders’ separate viewpoints – one Aquan, one Directorate. Delivered as high quality prints that gamers can frame. 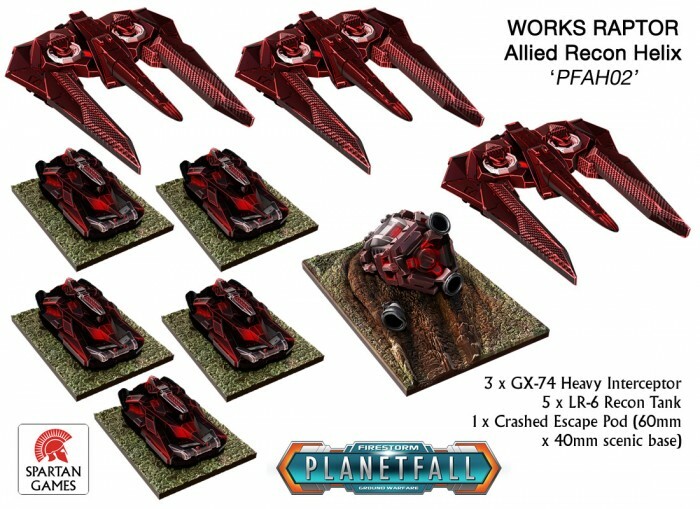 Note: All models you see digitally painted in the Planetfall release have been done using the actual 3D files used to create the models you will be able to buy. All models come unpainted and unassembled.